Last week was an up and down one for my fantasy surprises. While players like Cameron Brate, Kenny Britt, and the Texans defense came up big, there were also disappointments such as my selection of Jay Cutler. It’s hard to believe we’re already in week 11 of the fantasy season, but that just means we’re one step closer to the inevitable happening. That’s the emergence of the running back who swings thousands of leagues. Sometimes these guys are players who become more consistent threats in future seasons (like David Johnson), but often times they can be guys who get one of their few shots at starting and happen to perform in a big way. While we obviously don’t know who this back will be,they are certain to emerge. All you can do is keep your eyes peeled for them to emerge. QB: Blake Bortles vs Jaguars: Bortles has regressed as an actual quarterback in 2016, but as usual he can still put up counting numbers. In that note it’s clear that what equals problems for the Jaguars brass doesn’t always equate to problems for fantasy owners. The Lions secondary has their fair share of struggles, so if the Lions get out to an early lead Bortles will be throwing it early and often. Expect around 260 total yards and two touchdowns. RB: C.J. Prosise vs Eagles: Could Prosise be the type of back to swing leagues that I mentioned? There is a chance, as the Seahawks haven’t had a player that could provide what he can to the offense since Russell Wilson has been at the helm. Even against a stout Eagles defense, Prosise should see 15 or so touches and his ability as a receiver is another reason why you should feel comfortable using him in fantasy formats. Expect around 80 total yards and a touchdown. WR: Tyreek Hill vs Buccaneers: Do you like players with speed to burn? If so, Hill is one for you. 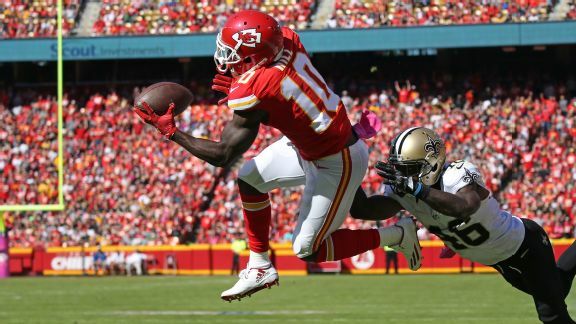 With Jeremy Maclin banged up, the Chiefs are still counting on other wideouts to emerge and the rookie Hill has shown what he’s capable of in that time. While the Chiefs don’t necessarily throw a ton, the upside is high against a struggling Buccaneers secondary. Expect around 70 yards and a touchdown. TE: Vernon Davis vs Packers: Don’t look now, but in recent weeks Davis has formed a nice rapport with Kirk Cousins. In a game with shootout potential, Davis makes for a nice option that could be available in a decent amount of leagues. Expect around 60 yards and a touchdown. K: Robbie Gould vs Bears: Kickers can have revenge games too. It will be odd seeing Gould going against the Bears, but once you get over that, one will see he has a favorable fantasy matchup this week. The opportunities should be there, so don’t be afraid to start him this week. Expect around three extra points and two field goals. DEF: Giants vs Bears: Despite not getting a ton of sacks on opposing quarterbacks, there is a lot to like in this matchup for the Giants. Not only is their defense improved as a whole, but Jay Cutler and the Bears are short handed in terms of what they have to work with. Alshon Jeffery is serving the first week of his suspension, and the running back corps is dealing with injuries. If they are available on waivers, this is a defense you should be able to start with confidence. Expect around three sacks, an interception and fumble recovery. This entry was posted in fantasy football, NFL, sleepers and tagged 2016 week 11 fantasy football predictions, Blake Bortles, C.J. Prosise, daily fantasy football advice, Fantasy football, New York Giants, NFL, Robbie Gould, Tyreek Hill, Vernon Davis. Bookmark the permalink.